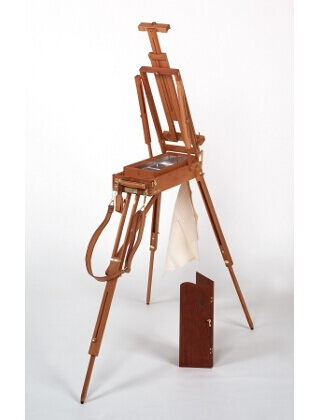 Authentic Jullian (Paris) Easel in Hand-crafted naturally dried Beechwood, stained mahogany color with brass and brass plated hardware. Metal in and under drawer with exclusive Jullian locking system and locking top drawer. Synthetic leather strap, tag holder and handle with beige backpack style carry bag included.